Hassett Park by Jane Irwin Landscape Architecture. From the landscape architect: Hassett Park is an urban park in the public domain framework for Campbell 5 in Canberra, part of a redevelopment of key inner city sites along Constitution Avenue. Campbell Section 5 occupies a pivotal site at the junction of two major axes; between Capital Hill and Mount Ainslie, and Civic and Russell. Few sites in Canberra are awarded the opportunity to reinforce the Griffin plan for the city in such a powerful way. The design process explored what makes a civic park through community consultation and comparative analysis of established local parks. The resulting design balances demand for recreation, culture and environment in order for educative and play opportunities and environmental systems can seamlessly come together to form an aesthetic frame. 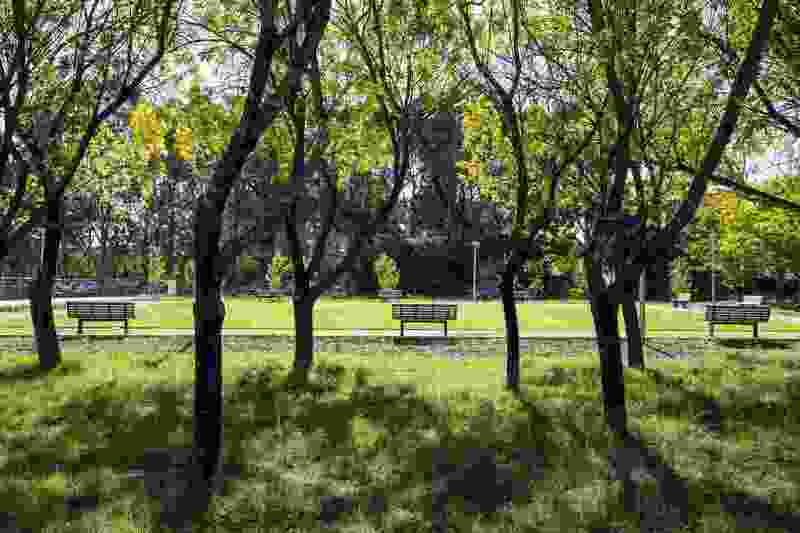 The park is overlooked by residential and mixed-use development on all sides, with direct connections to all streets that provide key public domain facilities to the new and existing community. 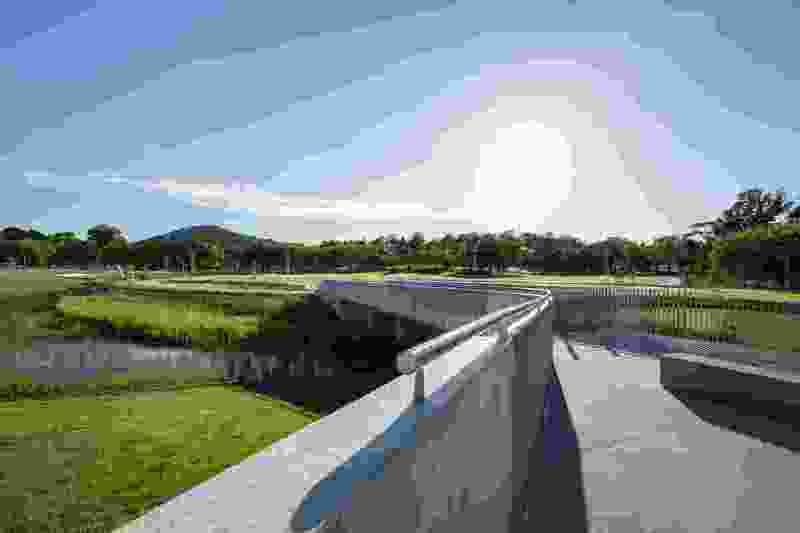 Internal movement systems are connected to existing and planned cycle routes while linking the existing suburb of Campbell to Lake Burley Griffin. The park is near the bottom of a large catchment that stretches to the top of ANZAC Parade and beyond. A pre-existing drainage line and farm dam on the site was used as a design cue for a new urban creek to be woven around the contours of the former gully. Sinuous walls and paths emanate from the path of the creek, structuring movement and use within the park. 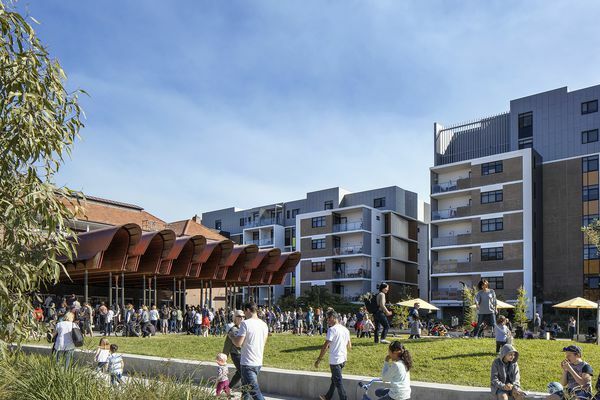 The streets and parks of Campbell 5 have been delivered as a framework for development; Hassett Park in particular provides immediate amenity for the surrounding community while the new wider community develops. 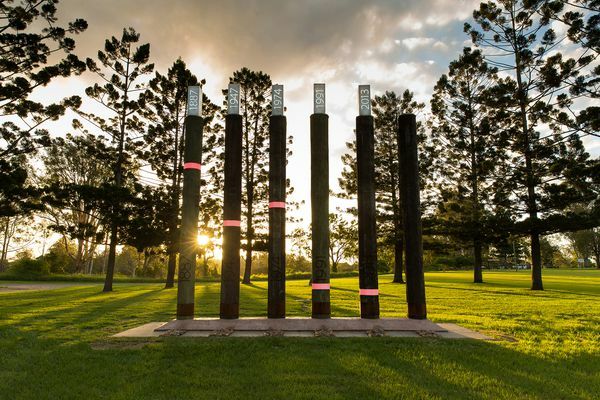 The park offers a variety of environments to foster diverse use, providing for children’s play, exercise, active recreation and gathering space for community and ANZAC events. The urban stream daylights and treats stormwater, creating a delightful educative overlay that reconnects people to natural systems in the city. We took the initiative of capturing stormwater from within the new development site and from the wider suburban catchment. The first flush from the piped system is brought to the surface, flows are then contained and filtered through the stream and wetlands, stored in tanks beneath the bridge, and finally re-used for irrigation or released into the lake. Design for sustainability was central to the design team’s objectives. 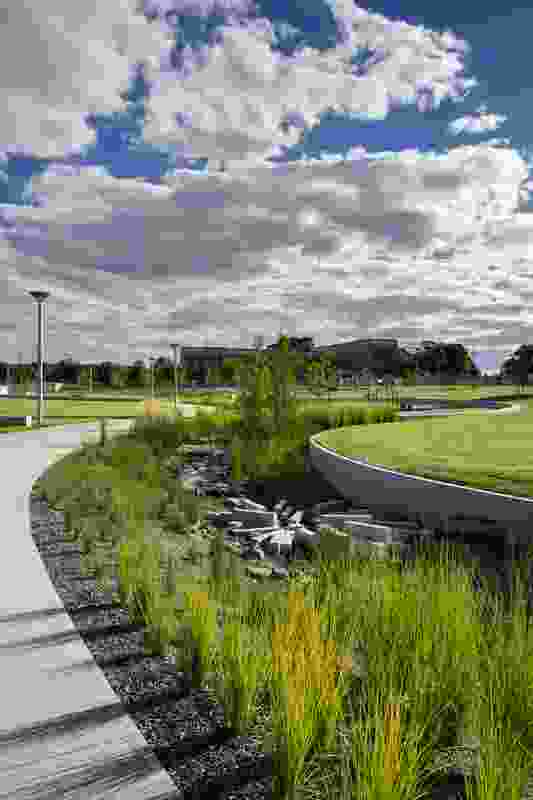 The park is functionally and aesthetically structured around Water Sensitive Urban Design systems, including water efficiency and fit-for-purpose supply through water harvesting. 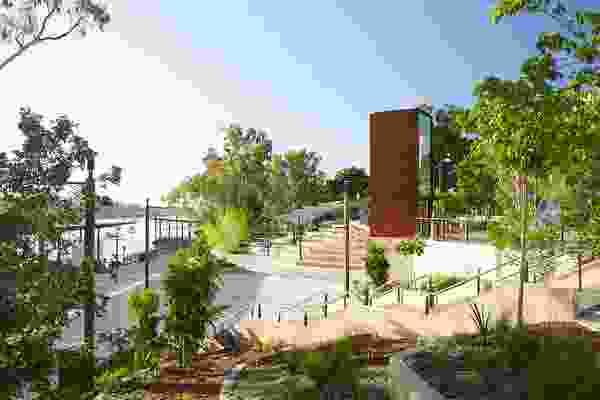 The design offers a clean and healthy water environment, flood mitigation, a reduction in water use for maintenance and cleaner water entering the lake. 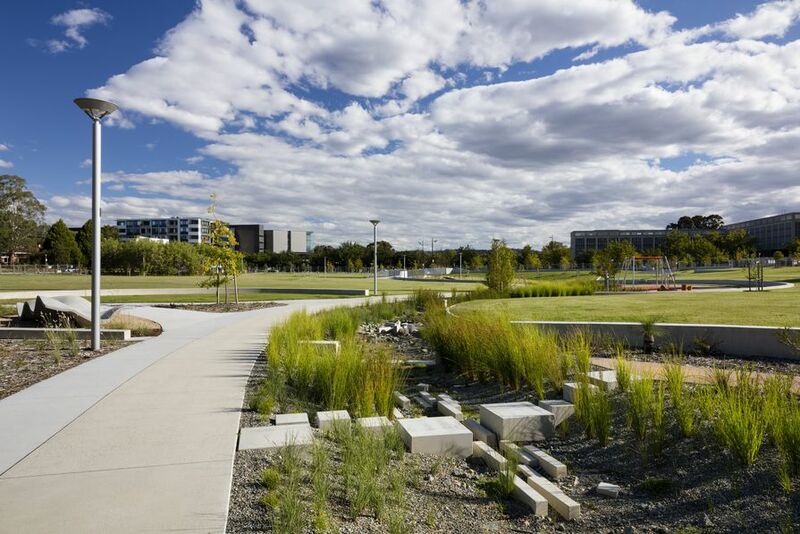 The seamless integration of recreation and water quality systems sets a new benchmark for civic park design, receiving a commendation in the Stormwater Award for Excellence 2016. The commercial success and social acceptance of the park design has encouraged the Land Development Agency to continue the principles embodied in the design in future projects. The design seeks to foster a new aesthetic that emerges from natural systems, merging the wild with the functional program of urban open space. Water Sensitive Urban Design is central in the structure of the park; it becomes part of daily movement, and part of the play experience. It heightens people’s awareness and passively educates users of the role of water in the environment in an immediate and delightful way. The grassland edges foster wildlife and introduce a wilder aesthetic to the urban park network in Canberra. Trees removed for development were reused as play elements, and new trees were a balance of deciduous and locally native species. Hassett Park has delivered a public realm that celebrates the value of open space in Canberra to the new residents of Campbell 5 as well as the existing population of Campbell. 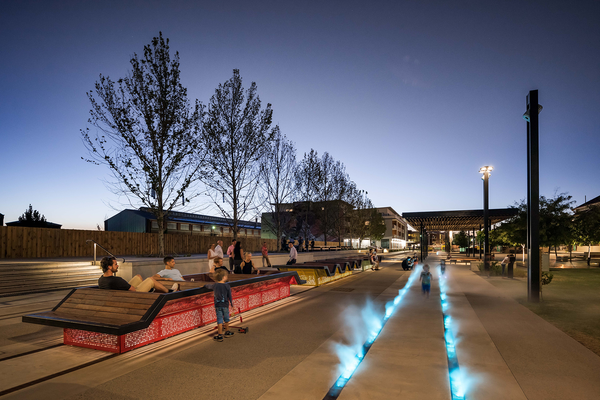 The design is testament that the Land Development Agency can deliver a high-quality public realm that goes above and beyond the needs and aspirations of the greater community, demonstrating the ACT Government’s commitment to first class urban renewal projects. At the time of sale, the design had a significant positive effect on land prices in the estate and the Land Development Agency is confident that its investment will have an equally positive social investment for the Campbell 5 residents and wider Canberra region.